We are a prominent enterprise, which is engaged in offering Birla White Building Material to the respectable clients. The offered range is known for rendering artistic expression in architectural design to the next level. Offering pristine white canvas for crafting architectural elegance, the offered range is appreciated for its exceedingly high refractive index and high opacity. Also, the offered range imparts brilliant luster and a smooth finish to surfaces, even when blended with pigments. of flaking, ruining the expensive coats of paint on your walls. A ideal wall putty is judged and chosen based on some essential qualities like durability, bonding, finish, coverage, water resistance, ease in application and pricing. Birla Wall care putty, with its intrinsic characteristics of strong binding with building surfaces, smooth finish, extensive coverage, superior refractive index, non hygroscopic composition, paint friendly nature, simple & facile application procedures and competitive pricing stands second to none. 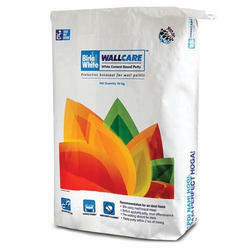 Birla White wall care putty offers the best putty for walls as suggested by its qualities, at affordable wall putty price It took pioneering years of research, innovation, testing and adopting intricate manufacturing procedures and models to make the wall putty price competitive enough without compromising the high quality standards maintained by Birla wall care putty. Birla wall care putty ensures the true depiction of wall putty colours as the salient chosen surface colour due to its high refractive index. After meticulous research and study Birla wall care putty developed a simple five step application procedure to suit all regions and circumstances. This makes it the most no nonsense and most effective procedure of the palpable procedures in use today. Birla White wall care putty is white cement based water resistant putty and moreover the incorporation of extra HP polymers and special chemicals make it an unparalleled product. When moisture seeps through the insides of a wall and reaches the paint surface, causing the colour coat on putty surface to crack making the wall appear old and dull. Even worse, these walls become a breeding ground for fungi. To fight this problem in the most effective way, Birla White Wall Care Putty has developed a formula with Extra HP Polymers. This unique formulation doesn’t allow water molecules to reach the paint surface, keeping your walls drier, safer and as beautiful as ever. Birla White Wallcare Putty offers you total protection against flaking. Its superior quality makes it the only putty in India to meet global standards. As a white cement-based putty, it binds strongly with the base plaster, even if the surface is damp, and forms a protective base. It fills up the fine pores in the walls and ceiling, gives you smooth and dry surface to paint on. With an effective protection against flaking, you are assured of aesthetic interiors at your dream home for years to come. Zero VOC & Green product, hence prevents health hazards . It's perfect for homes, offices, bungalows, outhouses, farmhouses, stadiums, shopping malls, technology parks, educational institutes, airports, railway stations, theatres, exhibition halls, flyover walls etc. 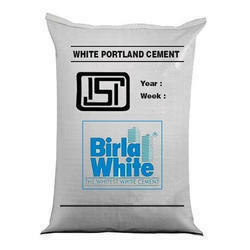 Birla White Cement as the name suggests is White Portland Cement produced in our manufacturing units, set up using most advanced technologies and state of the art manufacturing processes. It’s super fineness and superior whiteness makes it the most preferred product for architects, engineers, designers, contractors, masons, painters alike. Its exceedingly high refractive index and high opacity imparts brilliant lustre and a smooth finish to surfaces, even when blended with pigments. All these qualities bring out the creative genius in architecture, designing and complement the skill of the workers involved in construction of structures and buildings. The use of White Portland Cement has increased manifold in recent years. Added to it comes the commercial viability of its use in projects. Birla White cement offers value for money in terms of competitiveness and affordability in White Cement prices prevailing in the market at any given time. The cumulative effect is the freedom from hurdles and glitches in the path of creativity and affordable pricing. The pristine white and smooth surfaces made possible by the use of Birla White Cement gives the liberty to play with wide palette of colours, textures, shapes and sizes. Birla White is the most preferred White Cement for decorative paints, plasters, mosaic tiles, terrazzo flooring and white cement based value-added products. Birla white gives you long lasting wall and everlasting Pride! Looking for Birla White ?